Fallow deer are the most widespread deer in the UK and can be seen in numerous parks and forests. They are smaller than red deer but bigger than roe deer; however, if their size doesn't give their identity away, their long tail with a black stripe and palmate antlers should be the clinching factors. 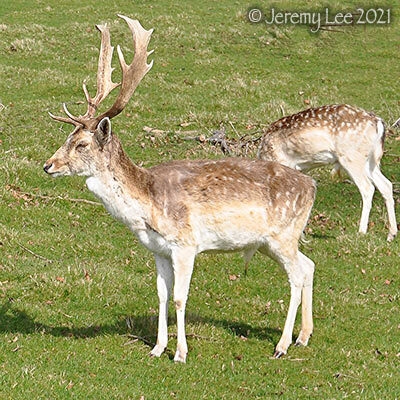 Fallow deer are sociable creatures, and for most of the year can be seen in two distinct unisex groups. The female (doe) gives birth in June and July and her young remain with her until the following year when the males (bucks), at about 18 months old, are pushed out and join the elder bucks. In spring the bucks start the annual cycle of shedding and regrowing their antlers. The antlers take 4-6 weeks to grow back, depending on the size and age of the animal, but they will be soft until about mid-August, leaving them vulnerable during this period. With their antlers formed and their confidence back, the rutting season will begin.